Pâte-de-verre is one of many techniques used in creating Liuli art. The process involves casting a wax sculpture in plaster, melting out that wax and adding glass ingredients to the leftover negative space. The advantage of this technique is the potential for incredible detail. Experimentation in pâte-de-verre is constantly expanding the creative realm of Liuli. According to known artifacts, the Chinese mastery of the technique dates back to the Han Dynasty (206 BC - 220 AD). However, the art was lost after this period and became a regretful void in the timeline of Chinese history. Pâte-de-verre did not reappear in the country until 1987 when LIULI revived the lost-art and in turn, Chinese Liuli. Because of it, there are over one hundred Liuli workshops in the Asian world that use pâte-de-verre nowadays. 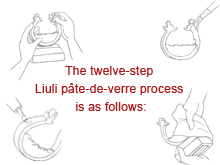 The Liuli pâte-de-verre technique involves a complex twelve-step process per creation. Each step must be performed without error to prevent breakage, irregular air pockets or impurities.